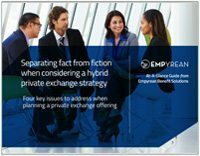 Learn how a hybrid private exchange might fit your organization’s employee benefits strategy by reading this free Guide. Use this At-A-Glance Guide to help you make a more informed decision about offering a private exchange for employee benefits, and the possible value to outsourcing benefits administration to help manage a hybrid private exchange strategy. If you have questions in the meantime, please contact us at sales@goempyrean.com or by calling 1-800-934-1451.